Why the Tampa Bay Lightning aren't done......yet. - The Point Data-driven hockey storytelling that gets right to the point. 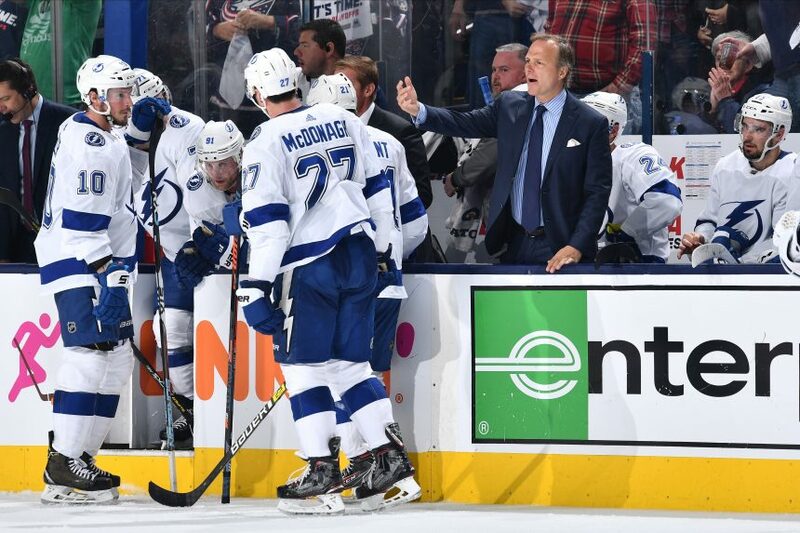 Why the Tampa Bay Lightning aren’t done……yet. What’s wrong with the Tampa Bay Lightning? Why can’t they score? How is it that Nikita Kucherov, Steven Stamkos and Brayden Point have a combined zero points? All valid questions but to point the finger solely at the Lightning for a lack of execution is to take credit from the biggest factor of all – Sergei Bobrovsky, who has been brilliant since a rough 1st period in Game 1, stopping 69 of 71 shots in his last 8 periods. Bobrovsky has outplayed Andrei Vasilevskiy and that’s the main reason the Blue Jackets are a win away from sweeping the 62-win Presidents Trophy winners. That said, I’m not writing off the Tampa Bay Lightning. Yes, the odds are massively stacked against them. Only four teams have ever come back from an 0-3 series deficit to win. However, if Vasilevskiy can find a way to match Bobrovsky’s play, the Lightning are capable of making a series of it. It’s a big if, but I don’t think Columbus has dominated Tampa Bay. I don’t think they’ve all of a sudden figured something out that no team, including themselves, couldn’t during the regular season. I do think they’ve played three terrific games, allowing themselves to be competitive in each and goaltending has been the biggest difference. 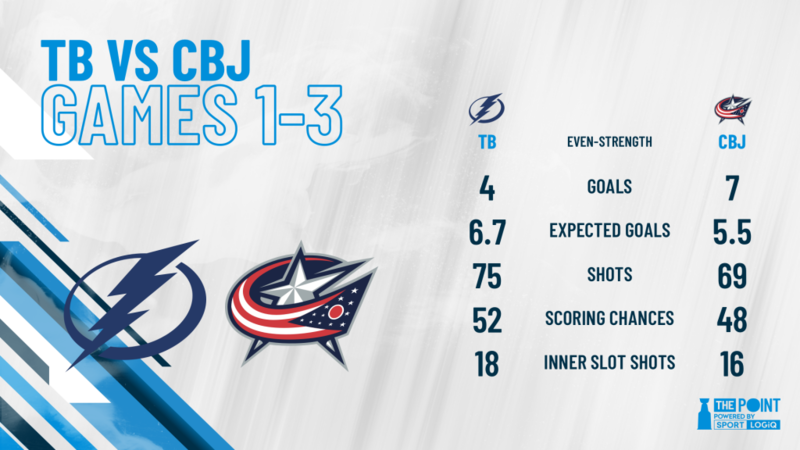 The Blue Jackets have outscored the Lightning 7-4 at even-strength and full marks to them for finishing their chances, something Stamkos, Point, Kucherov and others have not done for Tampa. However, the expected goals in the series, based on shot quality and quantity, actually favours the Lightning. This isn’t to suggest that the Lightning should be leading the series but, goaltending aside, play at even-strength has been relatively even. As for special teams, Tampa Bay had the best powerplay and the best penalty kill in the NHL during the regular season. They are last in both in the playoffs. Tampa’s penalty kill is batting .500, going 4 for 8. Vasilevskiy carried the PK in the regular season, posting, by far, the best shorthanded save percentage of any goalie. 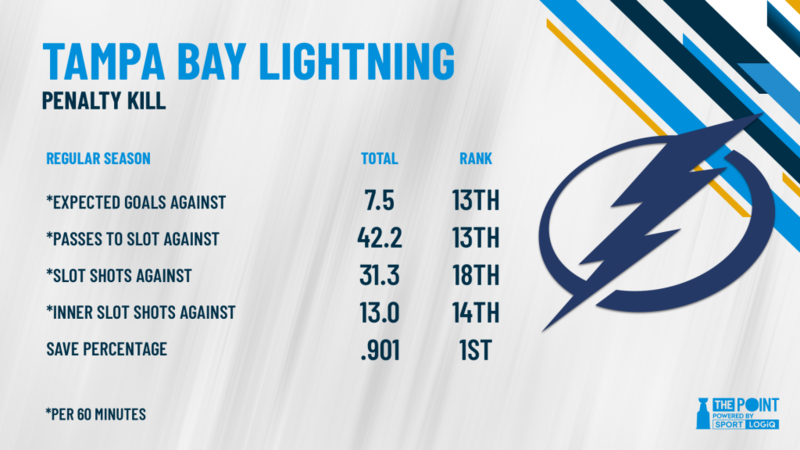 Take a look at where the Lightning ranked this year in our key performance indicators, as far as team defense on the PK is concerned. The penalty kill, aside from goaltending, was a a lot closer to average than elite. The second Vasilevskiy faltered, the penalty kill was going to be in trouble and that’s what’s happened in the playoffs. To the Blue Jackets credit, they’ve done a great job getting in front of Vasilevskiy and taking his sightline away, one of the reasons they have 4 powerplay goals in 3 games. Sergei Bobrovsky has been terrific. Andrei Vasilevskiy has gone from Vezina-calibre goaltending to below average. It’s not so much that he’s costing his team games but he’s not winning them games, either. That, to me, has been the biggest difference in this series. This series isn’t over, yet.